How Damaged Is Your DNA? DNA stores the genetic information in each living cell, so its integrity and stability is essential to life. 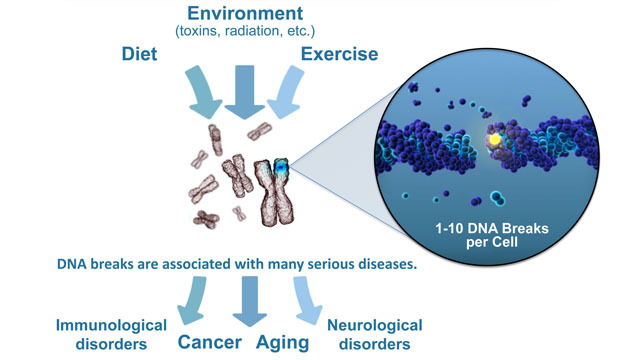 DNA is constantly being damaged by environmental factors like exposure to ionizing radiation, ultraviolet light and toxins. DNA replication is also prone to error during normal cell division. So your body is busy constantly repairing damaged DNA. However, sometimes this normal DNA repair process fails, causing DNA damage and genetic mutations to accumulate which leads to serious health problems like cancer, immunological disorders and neurological disorders. If your annual checkup included a simple blood test to determine how much DNA damage you have in your body, you may be able to optimize your long-term health by taking action to minimize DNA damage due to your diet, exercise and environment. A start-up company called Exogen Biotechnology wants to provide the public with a way to monitor their DNA health, so they can act to reduce their DNA damage. Exogen has developed technology that can rapidly quantify a type of DNA damage called double-strand breaks. Exogen’s DNA damage measurement is based on technology developed over 15 years ago called immunocytochemistry – a technique that uses a primary antibody that recognizes the protein that is repairing the DNA break, along with a secondary fluorescent antibody that binds to the primary antibody. This creates bright spots in the microscope image where there are double-strand DNA breaks, so scientists can take a picture and count the breaks. Exogen is moving this technique out of the laboratory to make it publicly available. They have significantly improved the technology, so that it’s feasible to rapidly test small blood samples for the level of DNA double-strand breaks. A customer collects tiny blood samples using an in-home kit, combines the blood samples with a fixative solution to preserve them, logs on to the Exogen website to register the samples and complete the questionnaire, and mails the samples to Exogen for analysis. Exogen tested their new technology in two pilot studies with a total of 97 people. They observed a significant increase in the level of DNA damage with age, where 70 year olds had double the number of DNA double-strand breaks compared to 20 year olds. The four people who had suffered from cancer also had a higher level of DNA damage compared to others in their age group. Inspired by the initial pilot studies, Exogen wants to build a large database of DNA damage levels for research purposes so they can better understand the meaning of an elevated level of DNA damage and how certain factors affect DNA health. Of course, their data collection process and database are secure, encrypted and fully HIPAA compliant. In order to get the necessary blood samples, they are currently running a crowdfunding campaign on Indiegogo. People that donate $99 receive a kit to safely collect three blood samples at home, and then they receive a report on their current level of DNA damage. Exogen is calling the campaign a “citizen science project” since volunteers also fill out questionnaires about their medical history and lifestyle. They’ve already collected $76,000 and the crowdfunding campaign runs through March 26. They plan to spend the money on a microscope and liquid handler, which will allow them to fully automate their system so they can analyze up to 400 blood samples per day. Currently, Exogen can’t interpret the results or give people advice about how to lower their DNA damage, because the Food and Drug Administration (FDA) hasn’t approved them as a diagnostic test. The goal of the crowdfunding campaign is to collect blood samples from 1000 people so they can go to the FDA. Costes stressed that their test is very different from genetic testing provided by companies like 23andme. Exogen isn’t looking at the genetic makeup. Instead, they are looking at a physiological response, so they compare it to a cholesterol test. One of their applications is to determine how DNA damage is affected by lifestyle factors like diet. Exogen plans to study a group of people for a long time to better understand how DNA damage correlates with specific diseases and with health improvements due to people’s actions. They want to evaluate whether people can improve their DNA health by changing their lifestyle or environment, instead of their fate being driven entirely by genetics. Author Jennifer HuberPosted on March 17, 2014 March 18, 2014 Categories HealthTags aging, cancer, crowdfunding, DNA, genetics, immunological disorders, neurological disordersLeave a comment on How Damaged Is Your DNA?